You never know when you might need a handyman around the house to fix things, decorate, plumb or just do odd jobs around the home. We would like you to know that you always have us to rely on when you need high quality services carried out by professionals. We can help you with any odd jobs you need doing around the home that you don’t have time to do yourself. Call us on 020 8434 7477 for further details and let us help you. Has something just broken in your home....or maybe a few things are not working in your house but you just can’t find time out of your hectic schedule to deal with them. Fortunately, there is an answer for you – hire us now! Whatever odd jobs you need doing, we can help and that indeed includes repairs. So the next time something stops working, you come straight to us and let us help you from start to end. You are guaranteed high quality services whenever you book with us and we’ll be able to fix absolutely anything. Our odd jobs man can help you with any plumbing you may need carrying out. Maybe the drains need unblocking? Whatever plumbing situation you have on your hands, we want you to know that you can count on our odd jobs man to carry out the service of your choice. You can’t take the risk of trying to sort out plumbing yourself. Ideally, you need the experts to help you with that otherwise you could really end up in deep trouble and end up causing more damage and chaos than you started. Always hire the experts in times of need. Painting isn’t hard work but one thing it is time consuming. Painting walls takes a lot of time and let’s be honest, it’s kind of a long and tedious job, even if it is quite simple. So hire us now if you would like our experts to paint for you. We can also decorate your home for you. If you would really like your home to look revamped, just hire us and we can paint, decorate or whatever else you need. Plus, you won’t beat our prices – they are the best in town! You should definitely hire Handyman Handy for odd jobs services and we can assure you, without any doubt, that you will be more than impressed. Odd little jobs may seem small but when you have a lot of them it can drain you of time that you probably don’t have much of. 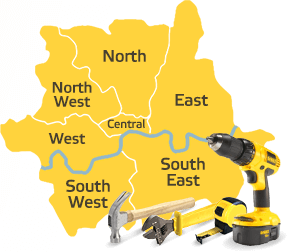 Instead, take the easy route and hire us today by getting in touch on 020 8434 7477. You will get a free estimate and lots of useful help and advice.